Ok, so as you may or may not remember, I am writing a series of blog posts to discuss my journey with chronic pain. For the full recap, click here. My last post ended just as I was about to have surgery to fix my herniated disc to address the back, leg, and calf pain I had been experiencing for five months. I was unresponsive to medications and injections, and surgery was the next option on the table. The procedure was a microdiscectomy and laminectomy at L5-S1. 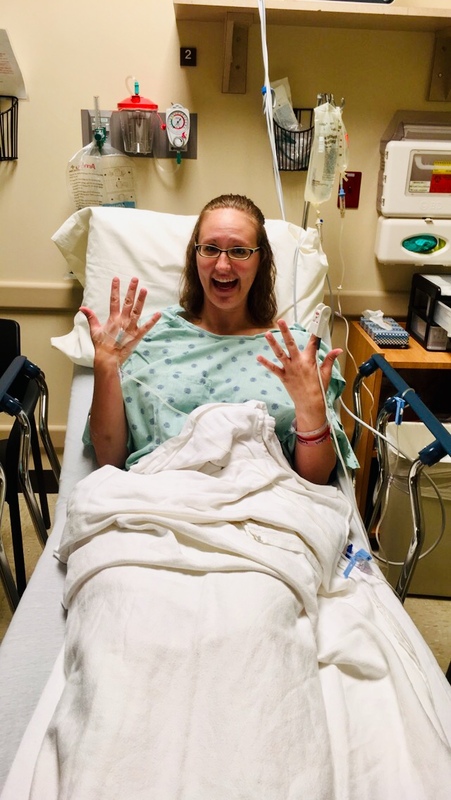 The pain was intolerable and had begun to change my quality of life and impact my relationships with others, so I jumped at the chance to have this procedure and remove the herniated disc that was the root of my pain. I was so relieved to finally have a viable plan in place, I was hardly even nervous for the surgery. I had never had any kind of invasive procedure done, so I had nothing to compare it to. It was all new, which meant I didn’t know what to fear. I eagerly planned and prepped, and after not-so-patiently waiting for the big day, it finally arrived. The answer to everything was one simple procedure away. My orthopedic surgeon performed a laminectomy and microdiscectomy early that morning, and I was home in bed, fast asleep by noon. Sounds easy, right? Not so much! A “simple” procedure is still surgery. I was put under general anesthetic, a tube was placed down my throat, an incision was made in my low back, a hunk of my bone was removed to allow access to my spinal canal, and a portion of the disc was removed/repaired. For a detailed explanation of how a surgeon performs a procedure such as this, check out this link. I had done my homework and read all about the surgery, but nothing prepared me for the post-surgical pain. As the years have passed, my overall memory of the pain has faded a bit, but I will never forget the immense pain I felt coming out of the anesthesia. I was not on pain medication yet, as they needed to make sure I was safely out from under the anesthesia prior to drugging me up further. This meant I was feeling everything they had just done to me. It was far and away the worst pain I had ever felt before or since! Once on the pain medication, things were much more tolerable. I balanced my recovery time between sitting, standing, and occasionally lying down. I closely followed my physical precautions requiring that I do not bend, lift, or twist, and I stuck to my carefully regimented walking program. I got really good at using my reaching device to pick things up, and could even close my dogs’ kennels with it. I also developed a curious dexterity with my toes, resulting in my ability to pick up just about anything I would need off the floor. It was, and still is, bizarre! Anyway, I treated my pain with narcotics and ice packs and kept my mind busy with adult coloring books, reading, and learning to watercolor. The healing process was going according to plan—almost. The only problem was that my nerve pain was still there. Wasn’t that supposed to be gone by now? I began to worry and eventually called my doctor’s office. They carefully explained to me that it was normal to have nerve pain after such a procedure, as they had used metal instruments to move the nerve during the surgery, and this frequently causes pain and irritation. I was told not to worry and was given a steroid pack to help aid in the reduction of the swelling. Whew, what a relief! Unfortunately, this was not actually the case. My surgical pain slowly ebbed away, but the nerve pain lingered long after the steroid pack was done. My surgeon did not have an explanation for this. He extended my recovery time, extended my precautions, and put me on Gabapentin to relieve the nerve pain. However, I did not recover with time, as he had hoped. He ordered another MRI and confirmed the surgery was successful, but still no pain relief. It still hurt to sit and bend and do all of the things it hurt to do before the surgery. Months had gone by now—months of missing work, of following precautions, of living in pain even when my solution had been given to me! Three months after the procedure, the only thing my surgeon had left to offer me was another surgery. The only thing was that the therapy was not helping. In fact, as time went on, my pain grew in intensity and moved to new parts of my legs and into my feet. I now understand that this was not necessarily the fault of my therapist but was likely due to the very nature of chronic pain. I worked hard in therapy anyway, but after a while, I began to want to start looking for answers again- different answers. It was incredibly frustrating to know and feel that something wasn’t right in my body. I was sure there was a mechanical explanation for my pain, but no one wanted to do more imaging. Couldn’t I just get an MRI done while I was sitting? Sitting was what hurt the most, so let's get a picture of what happens when I sit. Apparently, this was not an option, despite my continued inquiries and questions. Imagine being so sure you know how to find the answer to a question, but no one will let you look for it. Imagine having a burning question that you can’t quit thinking about but no way to find the answer. That frustration would take its toll, right? Right. It began to eat away at me and dampen my spirits. Unfortunately, I now know that increased frustration and low spirits greatly impact my pain levels. The situation I was in was only feeding my pain. In fact, I had no idea that what I was even suffering from was chronic pain. Chronic pain behaves differently than acute pain and little did I know, I was officially living in the land of chronic pain. However, I wouldn’t find this out for another 6 months though. At the time, I was still wanting a diagnosis of a physical deficit. But, after two months of physical therapy, I wasn’t having any luck getting a diagnosis or solution. My therapist was out of ideas and I was fed up, so I took some time off to enjoy the upcoming holidays. In the meantime, I set to work on finding a new doctor. I made it through Thanksgiving and Christmas without the added stress of attending physical therapy, and by the time the new year rolled around, I was all set up with a neurosurgeon who was happy to look at my case. My hopes were pinned to this man’s expertise, and I was dying to meet him and hear what he had to say. I was so tightly wound at the appointment that I started crying like crazy before I could get all of my questions out. Luckily, my mom was at the appointment with me and was able to verbalize my questions and concerns. The good news was that he didn’t think I should get a fusion. The bad news was that he wanted me to get more physical therapy. Seriously? The first two physical therapists I saw did not help my pain. What in the world would a third do differently? Despite being visibly upset, he assured me this physical therapist was different. He was so moved by my emotions that he even gave me a hug before leaving the room. Can you picture it? A surgeon who gives hugs! I was comforted by his kindness and decided to trust him. After all, what other option did I have? So, off to therapy, I went. Lo and behold, my neurosurgeon was right. This therapist was different! She is by far my favorite person I have met along this crazy pain journey. During our very first appointment, her soft-spoken confidence eased my fears and dried my brimming tears. She had experience with back pain and had all kinds of new ideas for me. I couldn’t wait to get her to work her magic during my next visit! It turns out, my new doctor knew I was experiencing chronic pain and was setting me down the path to try and reverse it. However, he didn’t ever mention the term “chronic” so I assumed I was still working towards fixing an injury. In my next post, I will explain all about my new therapist, how I came to the realization that this pain was chronic, and how I struggled to adjust to my new reality.